Most of the recent Arduino and compatible boards use some kind of USB to UART hardware (e.g. FT232RL in Arduino Duemilanove and Atmega8U2 in the latest Arduino Uno) for interfacing with computer USB ports. Since ATmega328 has native UART support, building an Arduino that interfaces with the serial port (RS232) directly is arguably much easier. And of course, there are still a lot of computers (especially servers) that support serial ports, so building an serial port only Arduino still makes sense in cases where USB connection is not necessary. Of course, you could always just build a serial port compatible Arduino using the reference design. In the official design, two transistors are used for converting the RS232 signal levels to UART compatible TTL signal levels and vice versa. 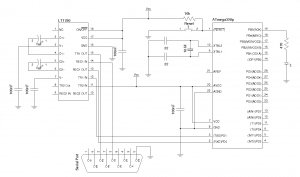 But with so many RS232 transceiver ICs on the market nowadays, this voltage translation can be done very easily. 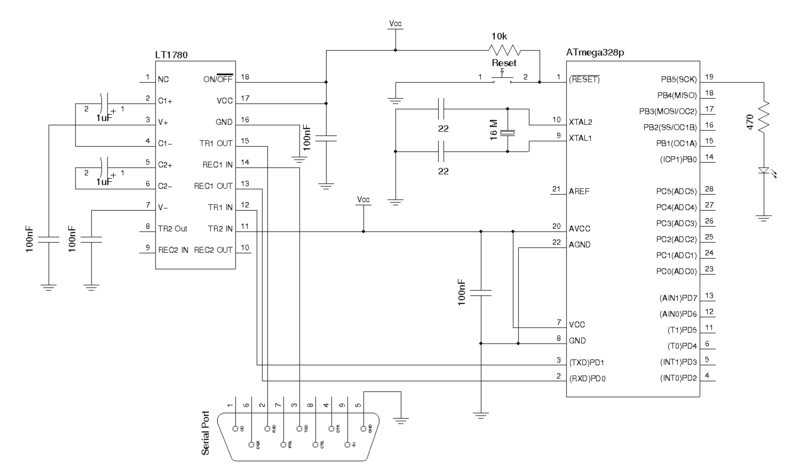 The following schematic shows one such designs using Linear Technology‘s LT1780 RS232 receiver. LT1780 has two RS232 receivers built-in. Since we are only using one channel, TR2 In should be tied to Vcc according to the datasheet. Other RS232/serial converter chips such as MAX232 can also be used. One thing to note is that the program uploading procedure is slightly different when using the design above. You must press the reset button right after the upload command is initiated in order to upload your programs (sketches). This is due to the fact that the DTR signal is connected to the reset pin (pin 1) on both Arduino Uno and Arduino Duemilanove, and the DTR signal automatically resets the ATMega328 prior to uploading. This is not the case for our design however, since most RS232 to serial chips only convert the TX and RX signals and thus this reset has to be triggered manually. Depending on the speed of your computer, it could mean anywhere between a split second to a few seconds after the upload process is initiated. Of course, you can always use an ICSP header for in-system programming the device. But being able to directly upload from the IDE makes programming and testing much more enjoyable. Having not actually bothered to try it yet myself, I may be entirely wrong here, but couldn’t you just route the DTR signal through the second channel? But the DTR signal would need voltage translation to convert from RS232 logic to TTL logic, correct? Yeah, but the LT1780 has two pairs of translators, so I think you can just use the second one. It is possible to upload sketches directly from the IDE using an ISP (yes, just by clicking the ordinary upload button) and it’s really comfortable when you use an alternative serial monitor program which you don’t need to close/reopen after each upload any more. All you need to do is adding “[board].upload.using=[programmer]” into the /arduino-022/hardware/boards.txt configuration file. That saved my day, thank you !!! !